The Castle of Weshire recently declared war on the Castle of Boston. The two armies soon met, the Boston King and Weshire King giving out orders from behind their lines of soldiers, surround by their spiritual advisors. However, due to recent political drama, the Boston King suspected that there was a traitor in the midst. He decided to try to catch the traitor in the act. There was no doubt that they would try to do something as the Wehsire Army distracted the Boston army. The first phase of the battle happened as the armies first marched forth towards each other. The Boston King wept in joy as he saw his son survive the charge. It was very bloody and emotional battle. The King thought he should keep his closest friends closer from now on, as to keep them from being killed, so they could properly advise him. The Boston King also sent extra, forbidden calvary as a sacrifice, so said in the respected rules of war, to confuse and anger the Weshire forces. During the second major event, the Weshire army hit Boston’s right flank, and raided some horses to strengthen their calvary. However, the Boston soldiers showed great bravery and managed the kill one of the Weshire army’s religious heads. One was promoted for their heroic act. Another, who died, but who was the bishop killer, was honored for his rightful vengeance. A good soldier always looks out for his King, and gives up their life the moment they see danger to them. Additionally, the Weshire King sent forth a forbidden soldier to the Boston’s King’s calvary trick,s Dan he also let his priest move in a manner never before permitted-directly passing the front lines. In the third and final swing of the battle, the left flank had been locked up, engaging in a ferocious battle. The Boston Army held a major card against Weshire by threatening to kill their king. Unfortunately, however, Weshire has managed trap the King’s wife after she moved to a bad spot while trying to talk to one of the Boston church priests. After some more battling, both sides agreed to a mutual truce and went home. After arriving back at his castle, the Boston King had a chat with his son, who was a knight. He was sure that a traitor had tried to do something during the battle to harm him in some way. His son shelled out some maps, one for each of the three phases of the battle. On these diagrams, the layout of the battle was shown in its entirety. It was always their army’s time to attack in the moments shown on the ink. Upon seeing the maps, the Boston King immediately knew who the traitor was. He ordered his council, parliament, advisors, priests, and judges to gather. He sent his son, along with two other knights, to go arrest the traitor. Who was the traitor who attempted to harm the Boston King? You must say which piece, and, if necessary it’s starting square, along with where it is in each of the three diagrams. You must also state at three reasons why said chosen piece is the traitor, one piece of proof per diagram/story that goes with it. Note: There is only one traitor-it is the same in all three diagrams. Note #4: Cheers to this question-"Murder! ", said the knight for inspiring me! UPDATE: Is, uh, anyone going to even try to solve this? We are told that in each diagram it is Boston King's turn. We are also told that the king sent some cavalry to be sacrificed, so we know how highly the king thinks about the knights. 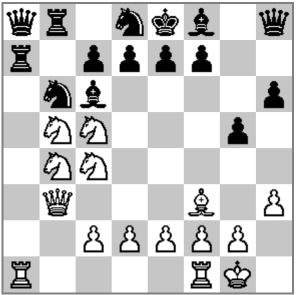 In this diagram the knight on F5 has the perfect opportunity to sacrifice himself to attack the Weshire Queen. It's a no-brainer, actually. However, since the queen survives until the end of the battle we know he didn't do it. Chickened out, as it were - or had some ulterior motives? This one is pretty easy, since we know the traitor doesn't change, and there is only one knight left. However, in this case there is also some evidence. We are told Boston King had a major card to play, but his queen got trapped and he was forced to agree to a truce. Now, if you want to play a major card but you can't because your queen is trapped, what do you do? Un-trap your queen! 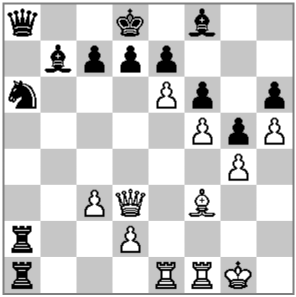 The Boston queen is trapped by the bishop on F3, and the bishop is protected by a rook and the Weshire queen. To easily get out of the trap the knight on A6 needs to move to C5 and attack the Weshire queen. If the queen is no longer protecting the F3 bishop, then the B7 bishop takes him, then the rook takes, then Boston queen takes rook and Boston is up material. 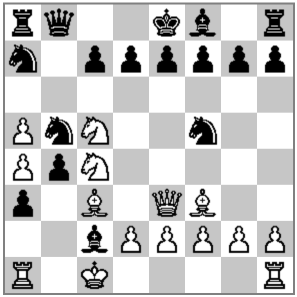 If the Weshire queen moves to E2 or E3, then the rook on A2 can take the pawn on D2. The Weshire queen takes rook, and is not protecting the bishop anymore. Bishop takes, rook takes, queen takes. Now Boston is still up a pawn in this exchange and the queen is no longer trapped, opening the battlefield up for this major card. So the knight really dropped a ball on this one - or did he? This one was a bit tricky, as there is no glaring evidence against him. But if you think about it, why did the knight move back behind the pawn line? He is not attacking any important squares there, and he is not defending anything. B7 is very well defended, C6 also has 2 defenders already, so does E6. F7 is not being attacked, and even if it was, there are better places to defend it from. There is no reason for that knight to have gone back to the 8th rank. To top it off, it would have required him at least 3 moves to get there - what a waste of time! Also he would have had to have gone through at least one turn where he could have attacked a Weshire piece, and where Weshire could have attacked him, but he got to where he was going unscathed. Collusion!! Was understandably livid. I don't envy that knight! The one remaining knight is the king's son, so he is beyond reproach, even though there's a ton of evidence against him. Looking at the other candidates we don't have much to work with. Half the pawns didn't even move, the other half are battling as they should. The dark squared bishop hasn't moved all game, if he was a traitor then he is an ineffective one. That leaves us with only the queen, two rooks and the light squared bishop. In the first diagram the rooks are blocked so they can't be doing anything suspicious. The bishop is all the way in Weshire territory though, talking to their king - highly suspicious! In the second diagram it is explained that Weshire "raided" horses from Boston on the right flank. Now how did that happen? Wait, who do we see on the right flank? The bishop! He's back, why? He is the one who helped Weshire get those extra horses. I'm sure the king thought up some excuse regarding the third diagram. But while I was trying to do the same, I found something very interesting: the king is an unreliable narrator! Regarding the first diagram the king says "It was very bloody and emotional battle". But if you look at the board, only one Weshire pawn is missing. Does that sound like a bloody and emotional battle? For the second diagram the king mentions that Weshire priest moved in a "never before permitted" manner, however, the one remaining Weshire bishop hasn't moved all game! For the third diagram, the king says the queen "moved to a bad spot" to talk to the bishop, but the queen hasn't moved from her place in the second diagram! So the king has no idea at all of what's going on. Not the answer you're looking for? Browse other questions tagged logical-deduction word story chess word-problem or ask your own question. What Imprisonment sentence will immortal citizen soldier Guilt receive?